Ciara was a beautiful and hardworking lady, in her single days she was that kind of lady who will make heads turn, beauty was not the only the thing that made her glow neither was it all about her intellect she had a good character and this was enough to make you to take her to Mama. Her parents got divorced when she was twelve she had to stay with her dad while her younger brother who was just nine then had to stay with her mom. Life was hell with her step mom, she was constantly maltreated and she spent a lot of nights wishing life was better. She was allowed to go and see her mom once in a year and each time she went to see her mom she did not want to come back home but there was nothing her mom could do. She secretly hated the idea of marriage but has she grew older her perspectives changed and she vowed never to miss it in Marriage. She was very intelligent she graduated with a second class upper and she got a very good paying job after the compulsory one year youth service. She was committed to the lord and his work, she met her Husband Charles in church they were friends for six months before he asked her out and she took her time to get all the confirmation she needed before she said yes to him. Ciara had had her heart broken several times before she decided to give the lord her love life and He in turn blessed her with Charles. Charles had liked Ciara the very first day he met her in the workers’ meeting after service, he sat beside her but there was something unusual about her and he knew he had to be her friend. After the meeting they exchanged contacts and they became friends, three months along he knew she was the one but he wanted to be sure by the sixth month of their friendship he was sure he wanted to spend the rest of his life with this amazing woman. One year later, they tied in the knot in Ciara’s local church, it was a very beautiful event and it was so obvious that Ciara who was the rejected stone has now become the cornerstone and she was grateful that the lord had kept her, she was glad her mum, dad and stepmom were all alive to be a part of her big day. She was 27 and her husband was 29 when they got married, she got married as a virgin but the problem came when she couldn’t conceive, she became worried but her husband was so supportive and he kept telling her that the Lord was faithful and just. She was later diagnosed with submucosal fibroid a type of fibroid which is found on the inner lining of the uterus and research has shown that is not so common but when Ciara was diagnosed with fibroids she almost ran mad, she felt so terrible but her husband stood by her, she had to undergo a surgery but even after the surgery nothing happened. Her mother-in-law made life difficult for her and every day she was reminded of her childlessness, she knew the lord told her she would be a mother of nations but it felt like those promises would never come true. Waiting became tough but she had to embrace patience and trust the process, five years after she delivered a set of twins, a boy and a girl and indeed her heart was full and filled with gratitude. The lord used her to start a ministry for women who were waiting and she shared her story with a lot of women and that story encouraged a lot of people in their wait. Waiting is not as easy as it sounds, I’ve had times I had to wait and I can tell you that it’s not so much fun. While waiting you really need to be patient but patience is a bit tough especially in this microwave generation where we want things done at the snap of our fingers but there is a process. 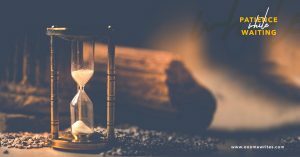 I wondered how Abraham and Sarah waited that long, the bible contains stories of men and women who had to wait for their promises to come to manifestation. If you ask any woman who is expecting a child she will tell you she can’t wait for the nine months to be over, she endures every form of pain just so she can have her child and when that child comes the pain is forgotten that’s what waiting feels like. 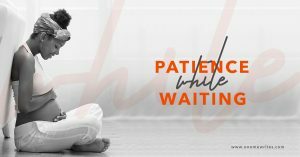 Warren buffet said “You can’t produce a baby in one month by getting nine women pregnant” some things just take time and you need to build the capacity to be patient while waiting. Meditate and confess God’s promises: You can never underestimate the place of confession, I just got to understand the efficiency of this tool and I can tell you it really works. You become what you confess, what has the lord said to you? What are His promises over your life? Keep confessing it. Pray again and again: when God gives you a word, it is your duty to birth it in the place of prayer, pray until you get the instructions, pray until you find peace and even after the promises get manifested don’t stop praying. Don’t become too busy. Build your faith: God never asks us to have a big faith, faith is not about the size it’s about the strength. Keep building your faith and find the strength to keep moving in difficult times. Waiting is never easy but the testimonies are always worth sharing at the end of the day you will be glad the lord took you the process. Trust the process, trust the father. Your story will encourage others, you are stronger just be patient!